Storm season in Memphis, TN is just around the corner. Thunderstorms can pop up out of nowhere, often times with violent winds and torrential downpours. 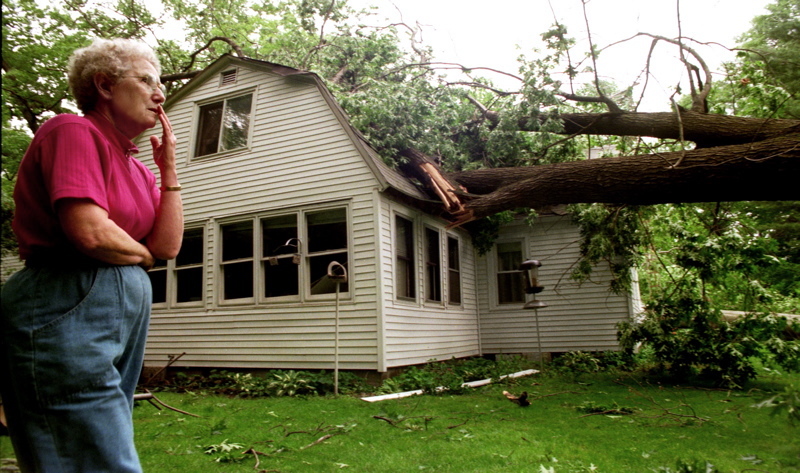 During such strong storms, trees can be blown over, or spit in half causing major damage to homes and landscaping. Fallen trees and broken limbs can be under a lot of pressure. The removal process should only be done by an experienced and insured emergency tree removal specialist. Damage to property or bodily harm can be done by an inexperienced person improperly attempting to remove dangerous trees. Our Emergency Tree Removal personnel are are very experienced, trained, and up to date on the safety practices for emergency tree service. Our experts know how to safely remove fallen trees while also preventing further damage to your home or landscaping. During dangerous tree removal projects, a crane or bucket truck may be used to assist in the process. Cranes can help stabilize and lift fallen trees out of homes, making it safer for the tree service expert, as well as protecting your home and landscaping. Our Emergency Tree Removal Memphis experts are on call 24/7 to assist you in time of need! Storm season in Memphis, TN can be brutal at times. Strong winds and heavy rains can bring trees down with merely a moments notice. After a storm hits, many people will see the storm as an opportunity to make some quick money on an emergency tree removal. Fly by night companies from out of town or even residents run to the nearest hardware store to grab a chainsaw and become “tree experts”. Don’t fall into the trap of hiring a uninsured or inexperienced company to handle your emergency tree removal project. By not having the proper equipment and experience, the person can cause more damage to your home, landscaping, or even end up hurting themselves. The art of tree removal is already dangerous enough as it is. When trees have fallen or started to lean, there can be dangerous pressure points that an unexperienced person may not know how to work with. Call Memphis Tree Service specialists anytime you find yourself in a dangerous tree situation. We have the knowledge and thousands of dollars invested in equipment to get the job done right. We are fully licensed and insured with to handle any Emergnecy Tree Service needs. Cool post! I learned a lot about how to handle an emergency tree removal. I really like how you said that ” Fallen trees and broken limbs can be under a lot of pressure. The removal process should only be done by an experienced and insured emergency tree removal specialist. ” I have never had to remove a tree before but it is just common sense that hiring a specialist is the smartest and safest option out there. Oh that picture makes me cringe! I would hate if that happened to my house. Luckily, I don’t think any of our big trees could reach our house. I can see why you would want to have an expert and is insured and all of that stuff. I wouldn’t want someone who didn’t know what they were doing because they could potentially make the problem worse. Great info, thanks!